Coin proof sets are sold by the United States Mint in annual sets usually containing one proof coin from each denomination struck that year. The first proof mint sets were offered in 1936. Early proof mint sets (1955-64) were sealed in transparent packaging like shown in the image on the left. 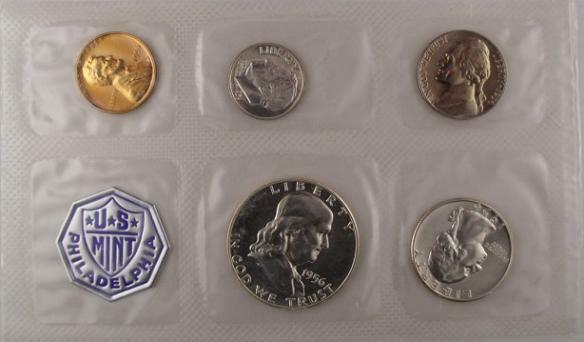 Beginning in 1965, however they began to seal the coins in hard plastic cases to better protect them. Some years proof coin sets containing commemorative coins of the same year were also available to collectors. These were called "Prestige Proof Sets" and were offered from 1983 to 1997, then again beginning in 2005 except with a different name - "Legacy Proof Sets". The Mint has also offered Silver Proof Sets since 1992, which include the proof dime, quarter(s) and half dollar that are made of 90% silver. 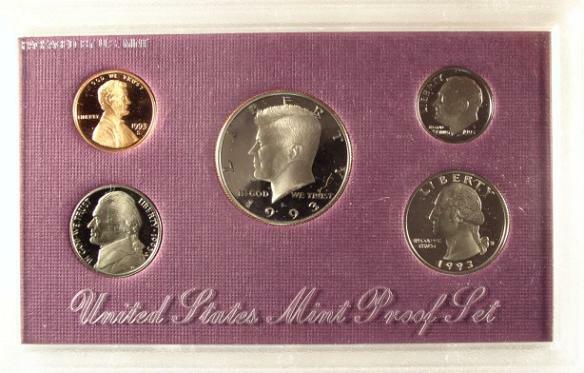 The Mint also offered a Premier Silver Proof Set, from 1992 through 1998. The only difference in the two types of silver proof sets is the fancier packaging of the premier set. 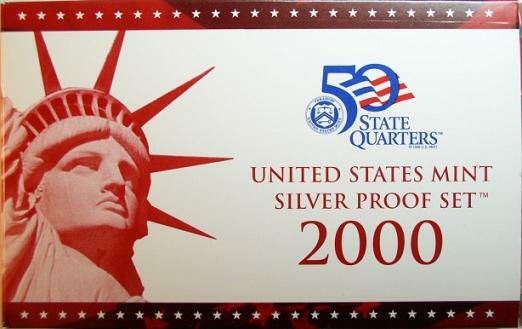 Beginning in 1999, when the state quarter program began, regular and silver proof sets both began including one of each of the five quarters issued each year. 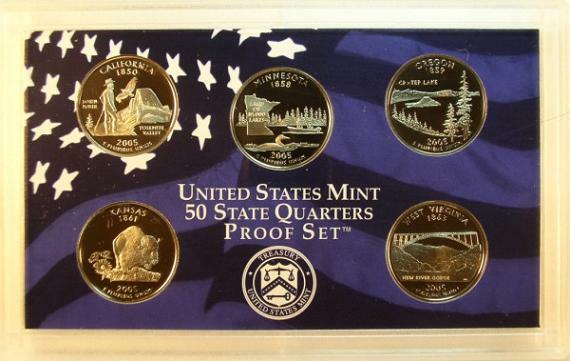 You can also get the quarters in separate proof sets for each year and as silver proof sets from 2004 forward. Dollar coins honoring former Presidents of the United States were minted beginning in 2007, and are also included in regular and silver proof sets in the year in which they were minted. They are being introduced at the rate of four per year. From 1965-1967 the mint made what they called Special Mint Sets instead of proof sets. They were not exactly as high of quality as proofs but a they were a better quality than the regular Uncirculated Coins. The Philadelphia Mint made proofs up until 1968. Now they are made at the San Francisco Mint.